Which Dub used Anime Logo do you prefer? I generally prefer the gold bar logo over the Geneon logo, simply because it looks more versatile in its usefulness between specials, movies, and series. Whereas the Geneon logo looks like it'd only be good for the red jacket series and not much else. I REALLY couldn't see this logo used for any of the specials or movies. Neither logo is fantastic by any means, but if I had to pick one, I'd go with the gold bar. I do wonder why they go for "Lupin the 3rd" instead of "Lupin III" on the materials, I mean Armitage III was an anime released here that went for that. Not sure why they shy away from it, when Lupin III is still how he's usually referred to in writing, on wikipedia and whatnot. Granted, Streamline and Animeigo did use the "III". I think it's because they want new people to know it's supposed to be "Lupin the Third" and not "Lupin Three" the first time they look at it. Definitely looking cool, it'd be excellent to see the bullet logo used in English releases. As for the Gold Bar versus Geneon logo, I go gold bar all the way. I remember when they first unveiled that Geneon Lupin logo, I thought it looked terrible. The gradient fill on the orange randomly darker and brighter, the odd placement of the letters, just heinous. Now years later, I don't feel as strongly on it but... still hideous I'd say. The gold bar, I don't mind it at all. It's on the upcoming TV release, and it still looks pretty good. Doesn't blow me away, but it's solid, I give it a 7.5 out of 10. I think it's just easier to read. "III" is really ambiguous. Does it mean "the Third" or does it mean the number "3," like it's the third in a series? When the title is just a name with a roman numeral after it, there's no context to help make that clear. 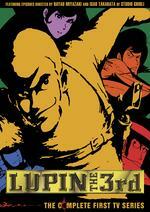 With the Streamline releases (Tales of the Wolf, Mamo), I saw a lot of "Lupin 3" reviews pop up (same for AnimEigo: "Rupan 3"). With "the 3rd" or "the Third," there's no question how to read it. "Lupin III" is probably a closer equivalent in length and script to「ルパン三世」, but in the Japanese logo, the meaning of 三世 is explicitly clear to a native speaker. Using "III" in English is much less so. Know what I mean? EDIT: Pfft, I didn't even see your post, Gold Demona. Didn't mean to ignore or upstage you. Another thing I'd like to mention is that I thought Armitage the Third was "Armitage 3," too. LOL, That's ok. I'm used to my posts being ignored. Personally, I'm not big on the script. Makes all the letters look like bones. I do like the idea using the bullet though. Oh, and congrats on actually taking this topic somewhere interesting.